Weekends are meant for exploring and the Womens Arctic Weekend Boot is the ideal winter boot to let you do just that, providing you with comfort and warmth in style, whether you're walking the dog or taking a relaxing sunday stroll to the pub. The stretch-fit top-line binding stays snug around your calf to keep warm air in and cold air out. 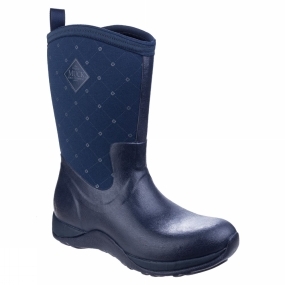 A cosy fleece-lined neoprene upper boot provides the supreme warmth, comfort and waterproofing that you expect from a Muck Boot winter welly, even working in temperatures as low as -29�C. An EVA midsole cushions every step and the multi-purpose rubber outsole provides optimal traction and stability.